We read with interest the paper by Chávez et al. 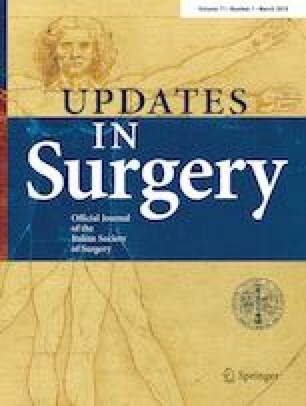 “Continuous intraoperative neural monitoring in thyroid surgery: a Mexican experience”, published on December issue of Updates in Surgery . The manuscript is greatly knowledgeable, and rise significant results on continuous intraoperative neural monitoring (CIONM) in thyroid surgery . Even though in contrast with our title statement, Chávez et al.’s report and other recent studies have shown that CIONM is associated with significant less permanent recurrent laryngeal nerve (RLN) injuries compared to intermitted neural monitoring (IONM) [1, 2, 3, 4, 5]. CIONM represents a gradually surgical progress, achieving and advancing to the objective of less RLN injuries [1, 2, 3, 4, 5]. Nevertheless, CIONM has some limits, both technological and interpretative. Simplification New surgical techniques and technology have simplified surgery and have enhanced the safety of procedures. The surgical placement step of CIONM probe should be simplified as it is time consuming and is considered to be more difficult than in other intermitted monitored and non-monitored procedures [6, 7, 8]. A new approach to the vagal nerve has been proposed to achieve procedure simplification . The first tests with prototypes of transcutaneous or percutaneous CIONM models demonstrated a significant feasibility . These technique appear to be equal compared to standard CIONM. Such new alternatives for CIONM, may improve safety and simplification . However, new CIONM probes have been addressed, there still are technical opportunities to simplify the CIONM procedure. Learning curve Learning curve issues and implementation errors have contributed to recent discussion about CIONM safety [7, 8]. Certainly, notwithstanding the well-known benefits of CIONM, proper training remains the gold standard for the safe CIONM procedure. Currently, there is no data available on the CIONM learning curve, both inherent to the technical component (i.e., using and setting up the CIONM equipment correctly) and the interpretive component (is the person performing the continuous monitoring able to distinguish between a true response versus an artifactual one?). Alarms threshold In the literature, there is some variation in the criteria used for “alerts” [1, 2, 3, 4, 5]. An “alert” must be raised because the following combined criteria (a) more than 50% amplitude loss, (b) more than 10% latency increase, (c) number of combined recordings, (d) synchronously and logically associated with high-risk surgical maneuver, (e) systemic, anesthetic, technical factors ruled out [1, 2, 3, 4, 5]. The stringency of the criteria for raising an “alert” is an important factor that is responsible for the different false-positive and false-negative rates. The uniformity in the criteria for “alerts” is essential. If a low threshold is used for raising an alert, then there is increased chance of false positives, with surgical procedures being unnecessarily altered or abandoned by these false positives. On the contrary, if a high threshold is used for raising an alert, then the chance of false negatives with resultant postoperative neurological deficits is a problem. Therefore, further research is definitely needed from the clinical sector to more fully define parameters for determining the significance of response decrement. RLN palsy still occurs with CIONM More importantly, the surgeon must know that even with the CIONM the RLN paralysis can occur. The CIONM allows to recognize and modify the surgical action in case of a dilatory, non-acute, RLN stress (i.e., traction, compression). Instead in case of rapid, sudden damage (i.e., thermal injury, section) the surgeon can not modify his surgical maneuver. CIONM allows to modify the surgical action for some profiles of combined amplitude and latency modification. Informed consent not required for this report.